Marine-Tex is the legendary high-strength repair compound designed for filling, bonding and rebuilding wood, fiberglass, ceramic, glass, metal, masonry and many plastics. Marine-Tex is manufactured to the highest standards to meet the harsh demands of the marine and industrial environments, and solve many problems for home, auto and hobby applications. Marine-Tex is a creamy paste consistency that can be applied on vertical or horizontal surfaces, easily fills gaps, and can be shaped to rebuild damaged components. Marine-Tex paste provides waterproof repairs that can be used with fiberglass tape or cloth to bridge holes and reinforce structural repairs as needed. Emergency and permanent repairs to machinery and equipment, hulls, decks, stripped fasteners, piping and tanks are all easily accomplished with the mighty repair kit. 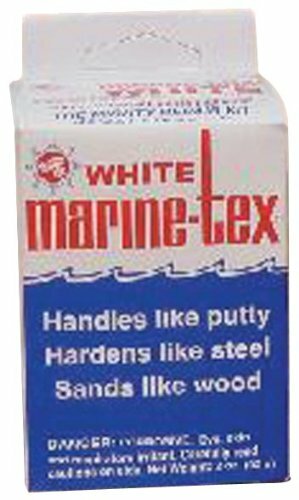 Marine-Tex can be sanded or ground to shape, tapped and drilled, and finished with most common paints and coatings.